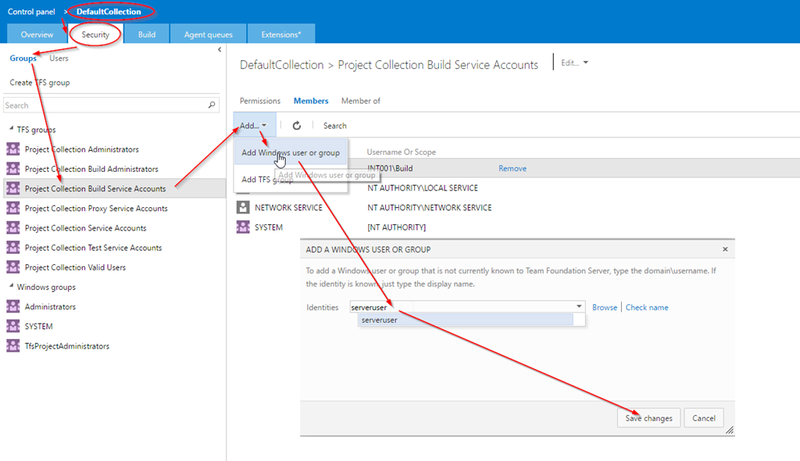 Recently we’ve installed and configured the Team Foundation Server on premise infrastructure. This was described here. In this post I would like to show you how to install and configure the build agent to work on a different machine separately from the TFS server, as it turned out to be quite tricky. My way to successfully set up the build agent for TFS 2015 was basically a try and fail process. I get an error, I found a solution I run the build again, then I get another error and so on. That’s why I will present you the result same way with a fail and success steps. Microsoft.VisualStudio.Services.Common.VssUnauthorizedException: VS30063: You are not authorized to access http://server2012.northeurope.cloudapp.azure.com:8080. After quite deep googling it turned out that the only workaround for this is a sort of hack. You have to create a shadow account on the agent machine with the user name and password exactly matchin the account which is used to access your TFS server! 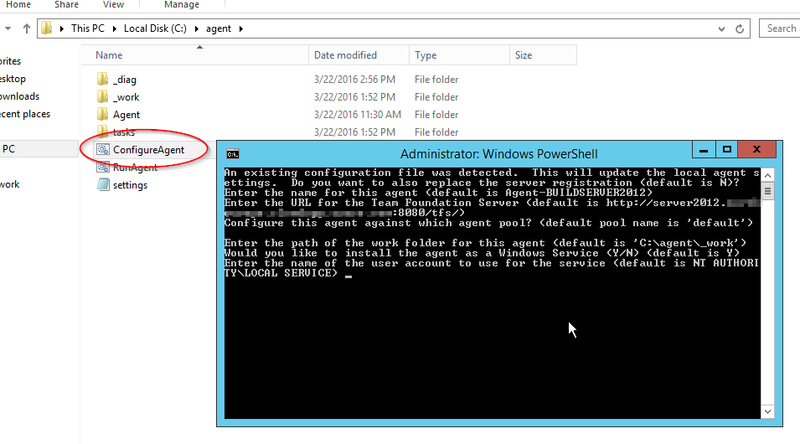 Then the build agent service must by running under this account. To achieve it create such local user on the build agent machine then go to properties dialog of the build agent service and set new user name and password in Log on tab. After restarting the service you should finally see it running green on the TFS web portal. AccessDeniedException: Access denied. serveruser needs Listen permissions for pool Default to perform the action. That was easy and turned out to be an incorrect notification url. Just need to go to the TFS administration console (on the TFS machine this time) and under the Application Tier update the Notification URL to be the one available for public. And finally, it worked and the build passed through. As you can see this is quite overkill if we want to have a build agent on a separate machine. Either I totally missed something and did it wrong or there is a huge need for user friendly improvements in this process. Few other problems are described in this post of Martin Hinshelwood. You made my day!!!!! I had a very similar issue, but creating the user account in the agent machine with the same name and password that I use to access the TFS, it worked!, now the agent appears with the green color and agent pool list, and the builds are working well! Thank you so much!!!!! Sergio.